Heading west from Minneapolis, we stayed one more night in Minnesota on our way to South Dakota. 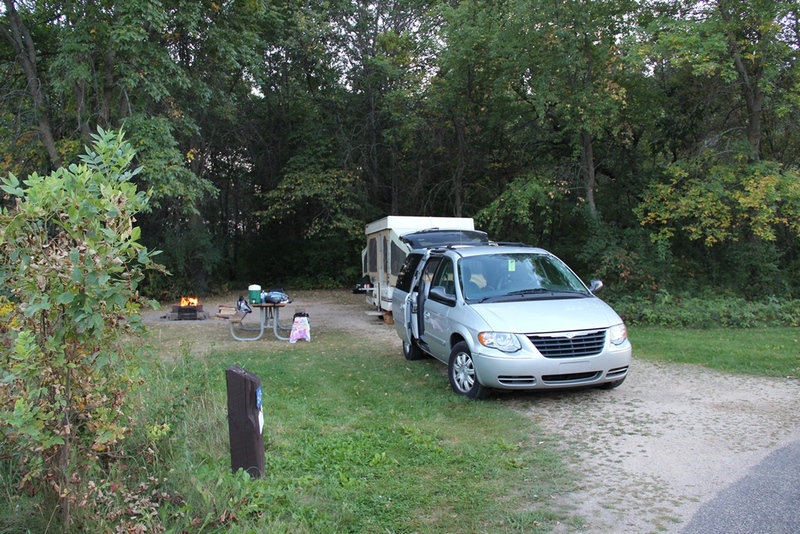 We stopped at a campground in Worthington, MN called Olson Park campground. 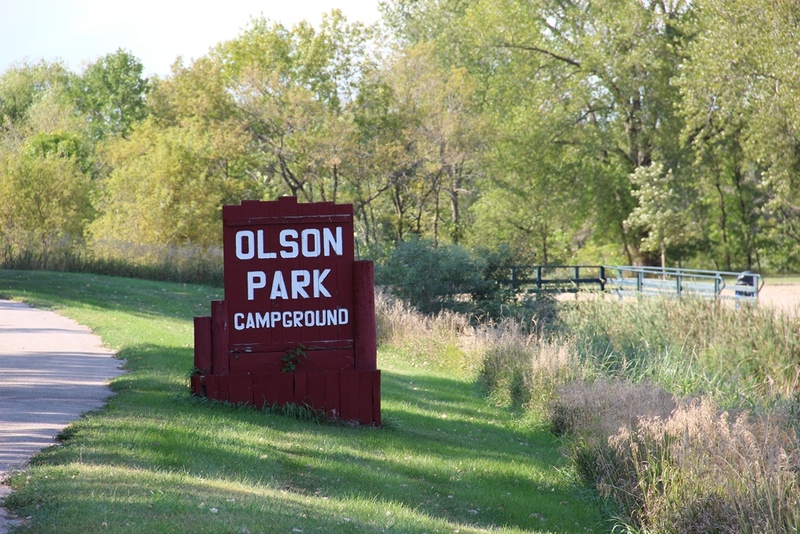 Olson Park is in a unique location by a lake (Lake Okabena) and a bay (Sunset Bay) that have just a thin strip of land between them – most of which is road. It was a nice, peaceful spot by the water. Price: $23/night, only cash accepted. There’s no office to register when you come in (at least not after Labor Day), but you can just choose an available site and the manager will come around in the evening and collect the fee. Location: It’s right by a lake in a pretty area, and it was just the right distance between destinations for us, but otherwise it’s not really close to anything noteworthy as far as I know. Facilities: Bathrooms and showers only. The shower had no way to adjust the water temperature, and the pressure came out like a pressure-washer. Doable if you’re an adult I guess, but it was not a good place to shower the kids. The playground was good and even had some equipment adapted for kids with disabilities. Site Description: Lots of shade and trees, and in early September, a lot of leaves on the ground too. 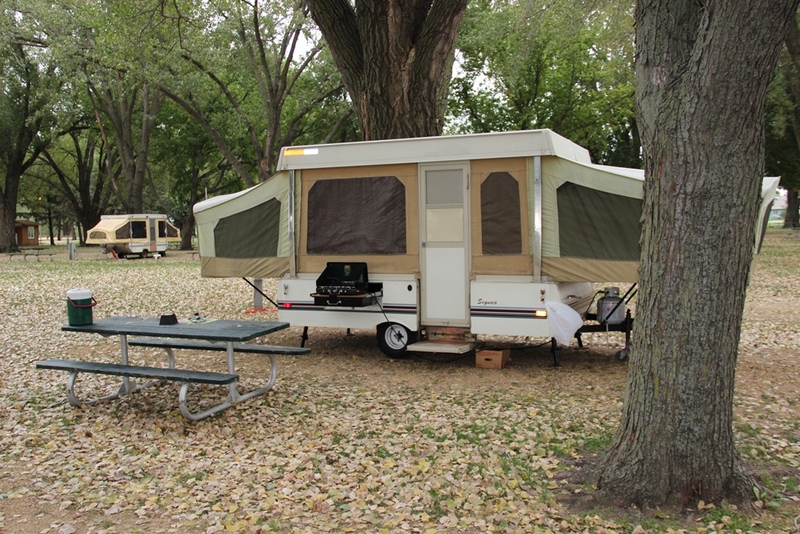 Neighborhood: There were not many other campers at Olson Park when we were there. It was relatively quiet and we didn’t really talk to anyone other than the manager. Comments: This was only a short stop for us, so it was great. I’m not sure I would have enjoyed staying much longer though. The facilities left a lot to be desired for a longer stay. 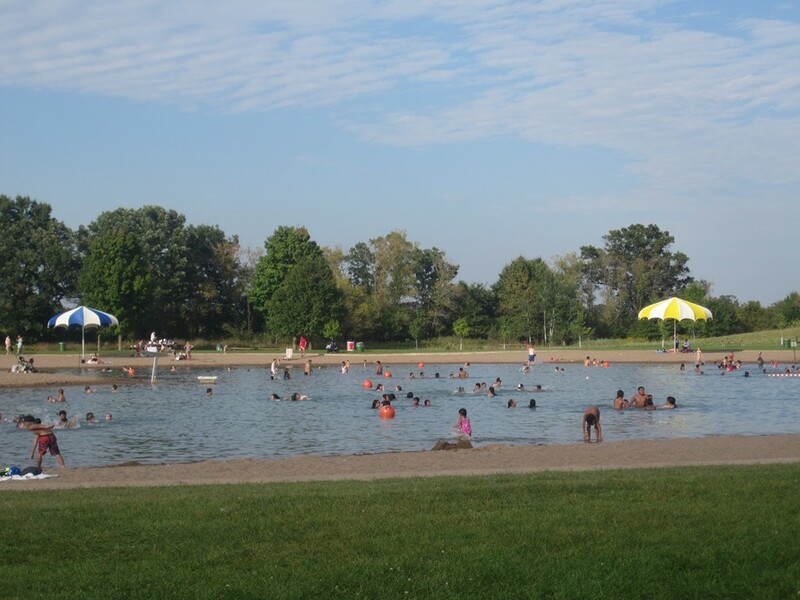 Also worth noting, there are spots that are considered “lake front” and which cost more, but the view is largely obstructed by trees and there’s a road between the campground and the lake, so it doesn’t really feel like “lake front” and, in my opinion, is certainly not worth paying any extra for. Well, add us to the ranks of Swedes who love Minnesota. 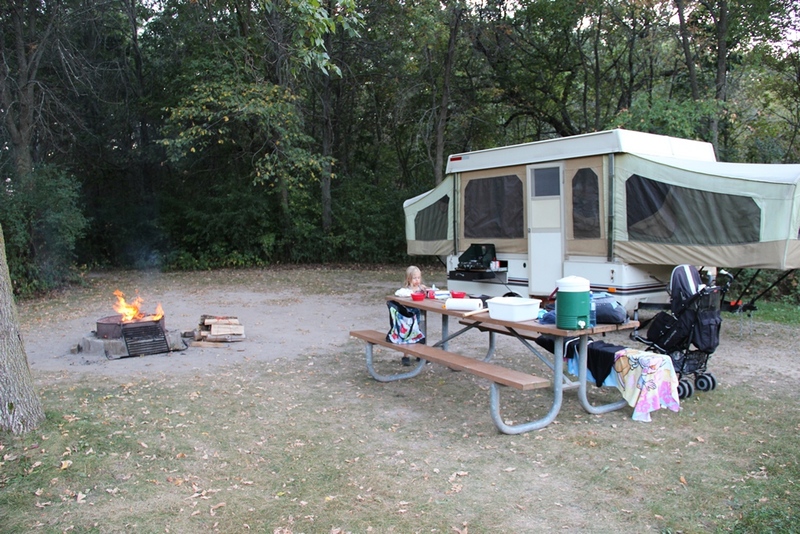 And the campground at the Lake Elmo Park Reserve, outside of Minneapolis/St. 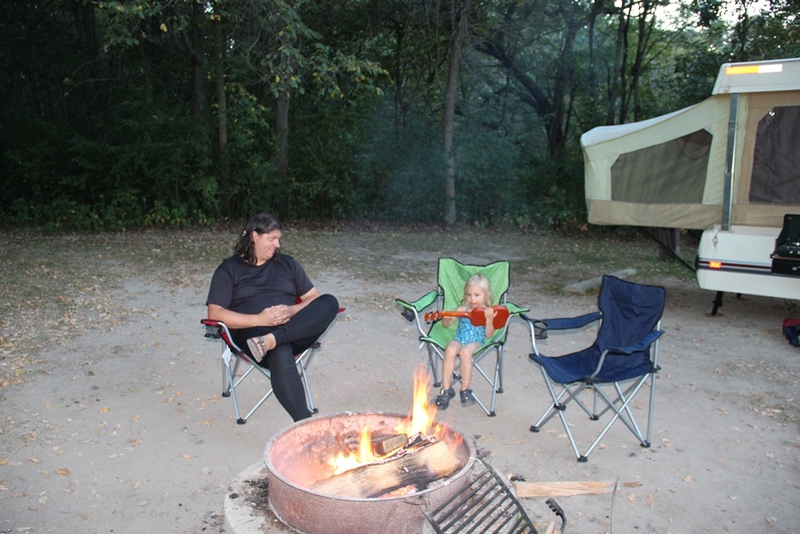 Paul, is still our favorite out of all the campgrounds we’ve been to so far. It was wooded and there were enough trees between each individual site that there was plenty of privacy and had almost a backcountry feel to it (if you don’t look toward the road). It was the first place we’ve actually needed flashlights after dark, and it was dark enough to really see the stars. Look at all those trees! And it’s nice and big. A lot of places we’ve stayed would have fit at least 4 enormous RVs into a site this size. While we were staying in Lake Elmo, other than visiting the Mall of America, we didn’t do a whole lot of “touristy” things either. 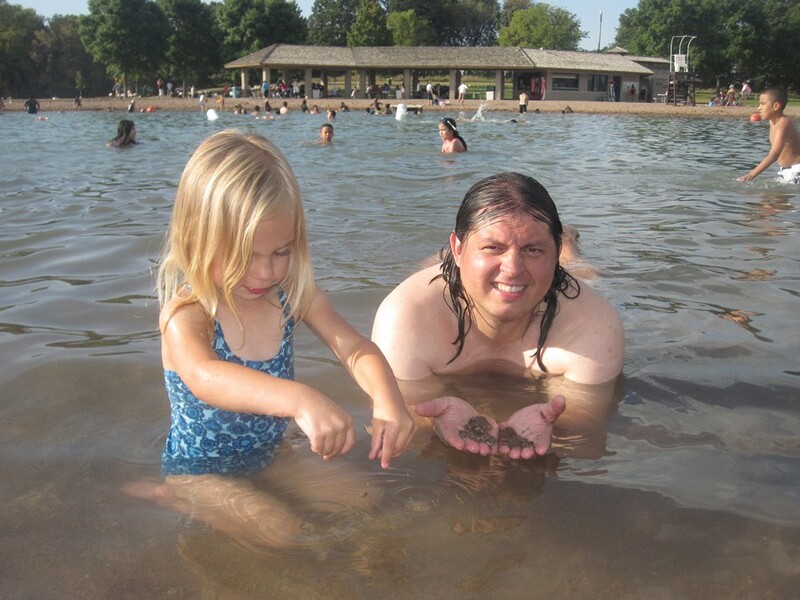 We went swimming in the lake – a man-made, chlorinated and filtered lake with a sand bottom and sand beaches. It was just sad that the lake closed after Labor Day, so we only got a chance to swim on the first night when we arrived. We took walks, went geocaching and took care of some errands in the local area. We liked it there so much we decided to stay an extra night. Emelie even took a nap, which so far she’s only really done in the car on longer drives. 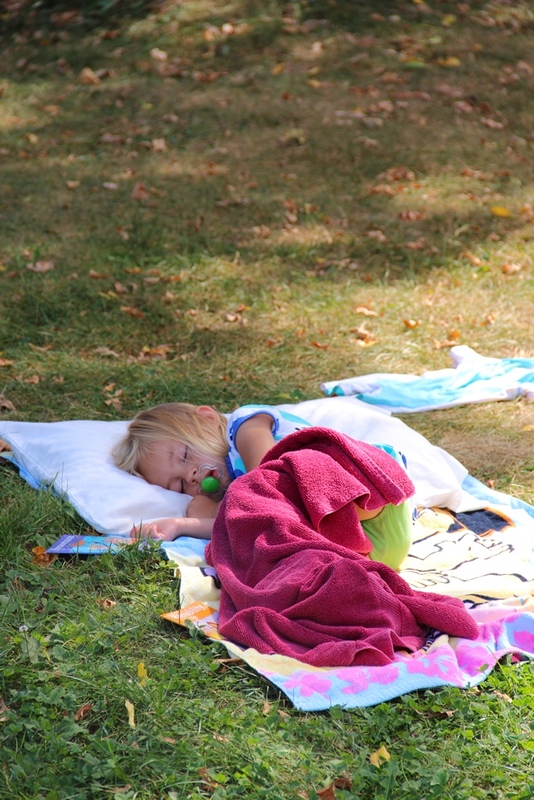 She wanted to sleep outside in the grass. We lit campfires at night and made s’mores and chocolate bananas over the fire. 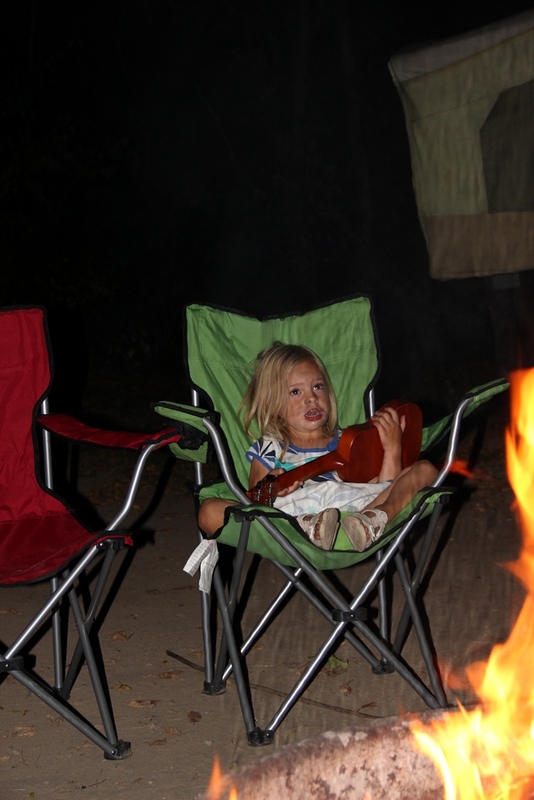 Staffan got out his ukulele, but it was Emelie who played most of our “campfire songs” and he didn’t get much chance to play until after she was asleep. As we headed west from there, we’ve run into fire bans because of the dry conditions and the risk of wildfires, so we’re especially thankful to have had those few nights enjoying campfires. One of her many self-composed songs. You really have to see the video to do it justice. No, Pappa. It’s my “tittar”! I have to sing! I LOVE the marshmallows Mommy! See how I hug them? 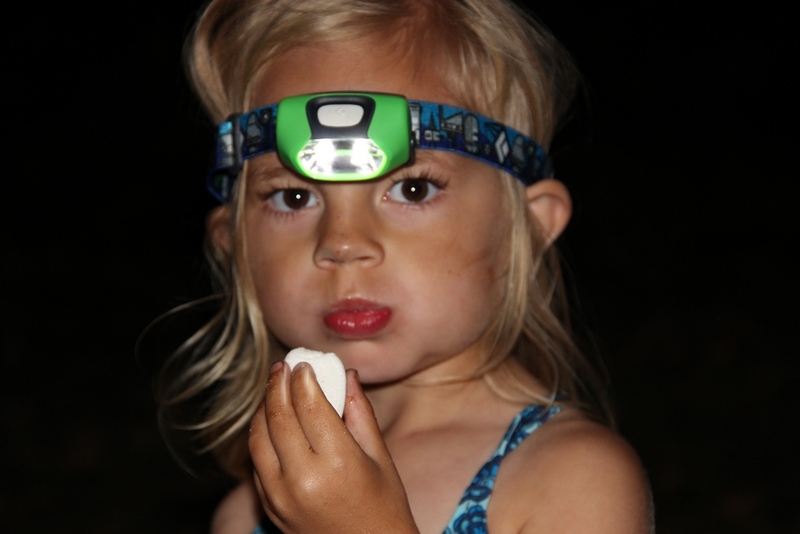 The complete look: bathing suit, headlamp, marshmallow. 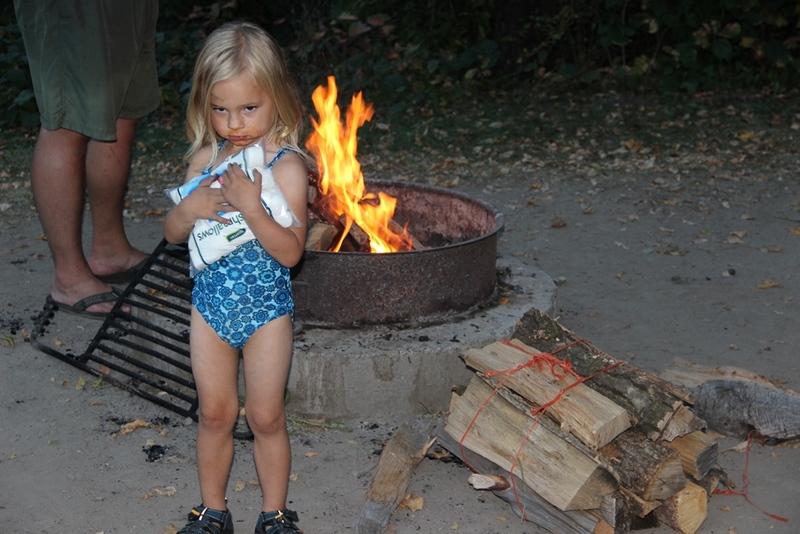 This girl is camping. 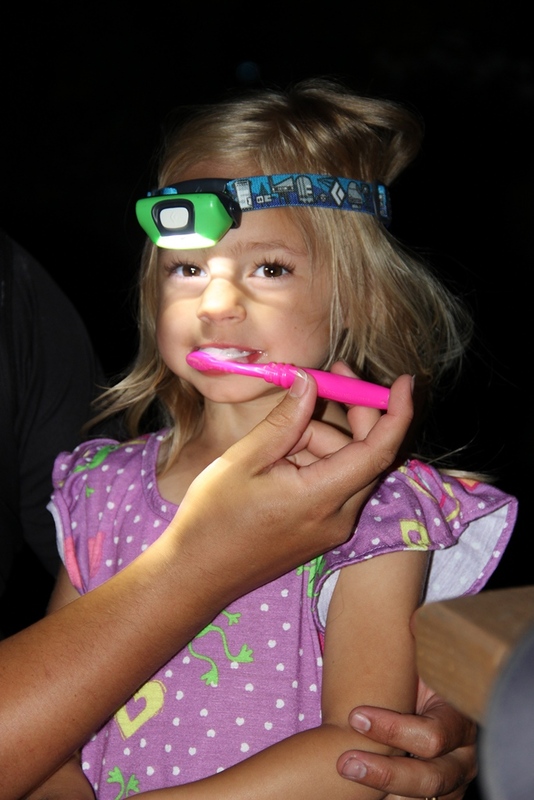 Brushing teeth outside in the dark by the light of her headlamp. One of the few times that tooth brushing isn’t a battle. Price: $18/night plus $5/day for a park vehicle pass. Except for the first non-holiday Tuesday of the month when the vehicle pass is free. That was a bonus. This was a really great price, especially for what it was. Location: about 30 min by car from the Minneapolis/St. Paul airport and Mall of America. Shopping and restaurants available nearby. Facilities: Our particular site was a little far from the bathrooms and showers, but that was our choice. The bathrooms were clean, the showers were warm. 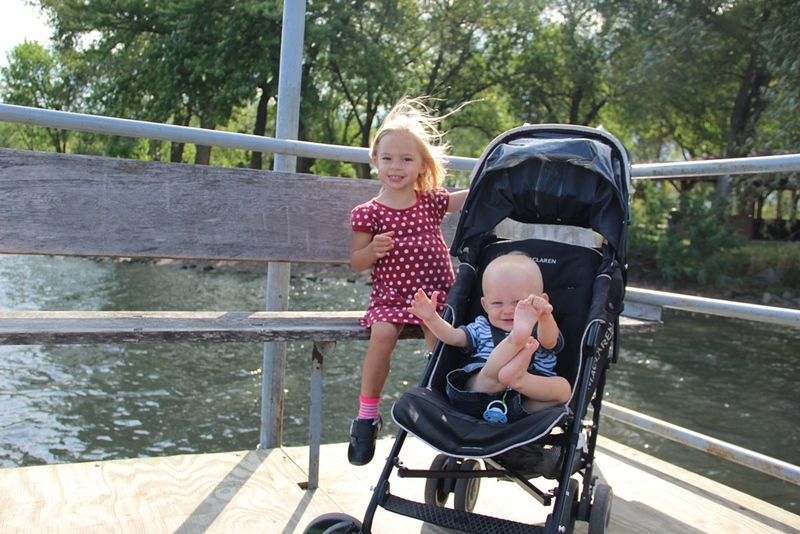 The park has several really great playgrounds, and of course the lake mentioned above. Our site had electric but we had to walk a bit to the water spigot. Sites with electric and water on site cost a little more. No dish washing sink or wifi. Site description: Grassy, spacious, and wooded. 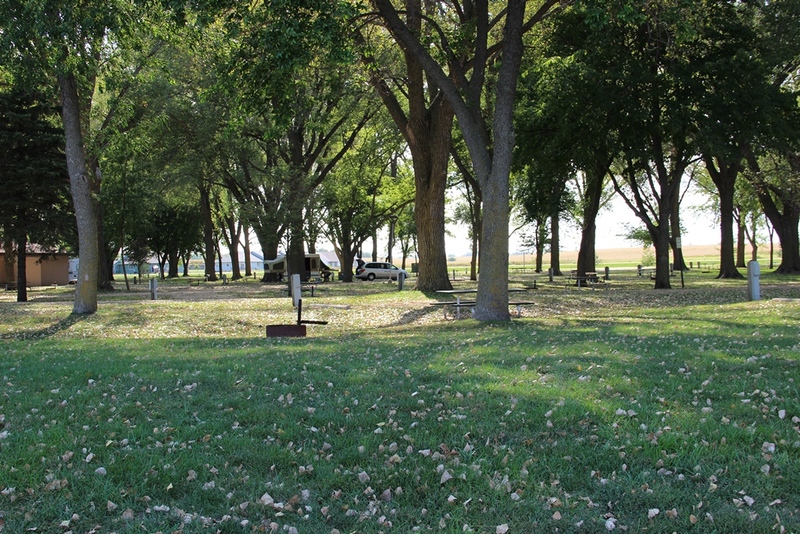 Nice fire pit and picnic table areas. Neighborhood: There were several other campers there but it wasn’t crowded. Even if it had been, we didn’t have much contact with our neighbors thanks for all of those lovely trees. We’re not exactly mall enthusiasts. This shouldn’t really surprise anyone. 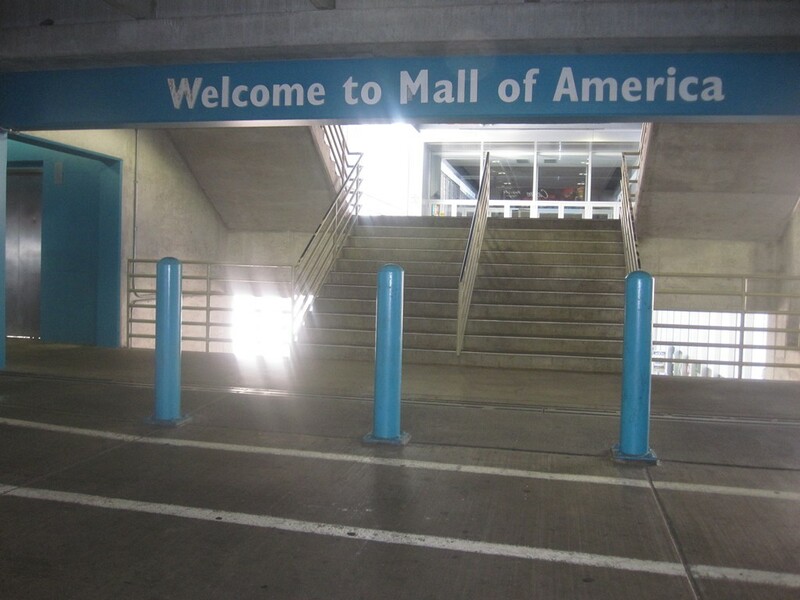 But when we happen to be in the area of America’s largest mall, we had to check it out. And when this mall has a program called “Toddler Tuesdays” and we have toddlers and happen to be in town on a Tuesday… done deal. So we decided to brave the Mall of America. And we had a great day! Picture in the parking garage. I took the camera out to photograph where we parked so we’d be able to find our car again. 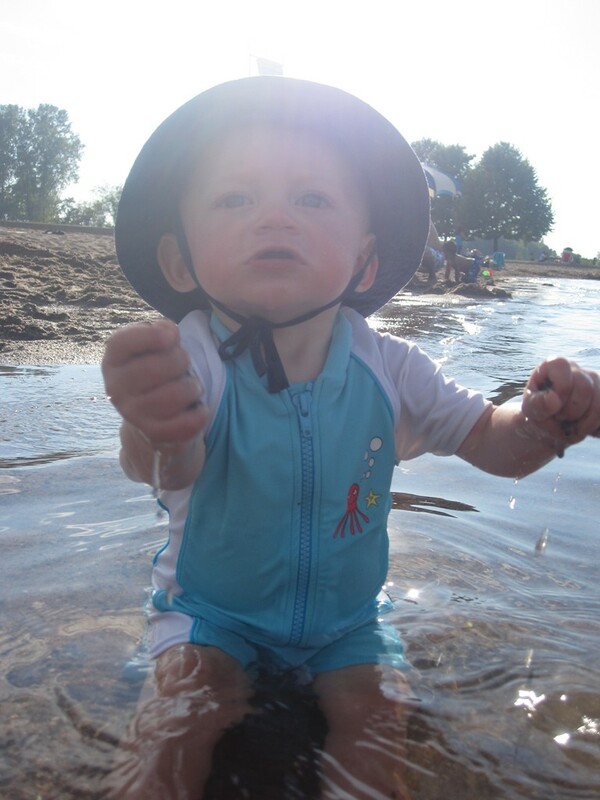 “Toddler Tuesdays” means that they have something special (and free) for kids under 5 every Tuesday. The week we were there, it was mini golf. 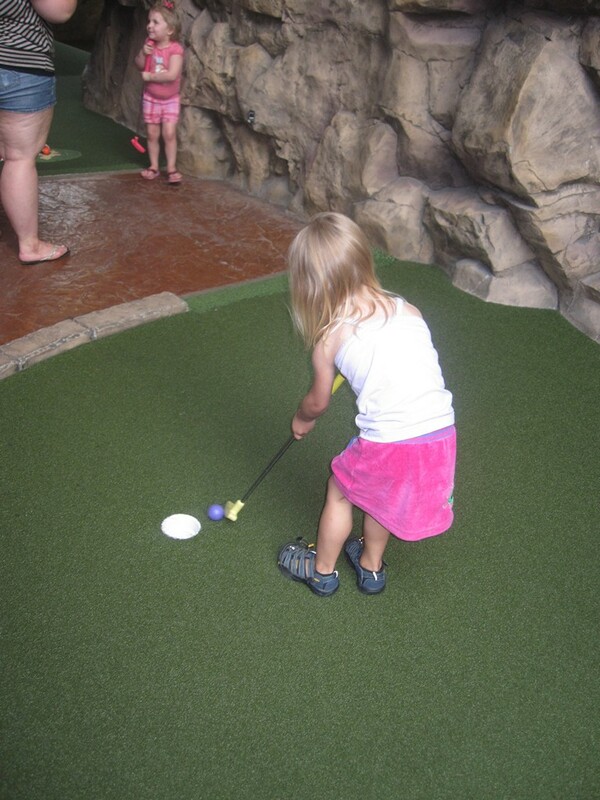 It was Emelie’s first attempt at mini golf and let’s just say I’m glad we didn’t pay for it. She didn’t get it. At all. She wanted to pick up the ball every time she hit it and she thought it was much more fun to roll it in with her hands. And she wanted to help everyone else roll their balls into the cups too. Thankfully, no one around us had paid for it either, and none of their kids got it either. So all around us were boys playing sword fights with their clubs and little girls talking about their favorite ball colors, and basically complete golf anarchy. It was hilarious. We, like just about everyone else, gave up after about 7 holes. 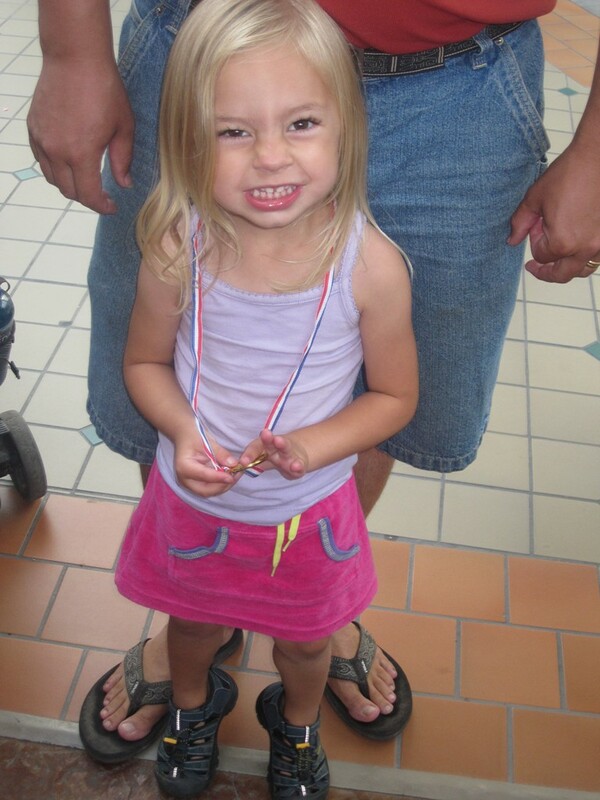 But all the kids got medals at the end.. She was so proud and excited! And we eventually had to hide it because she insisted on sleeping in it and I was afraid she’d strangle herself. This was taken on the first hole. And I’m glad I took it then, because it was one of the few times she’s sort of doing it the way it’s intended. The only picture of the medal that even semi turned out. If you look closely she’s standing on her toes. But otherwise there was just too much jumping up and down for a decent picture. There is also an amusement park in the center of the mall. Not just a carousel or a couple of rides, but an actual amusement park. Our original plan was to skip the rides altogether. But then we saw it. The swing ride. In several of the places we’ve been this summer, they had the swing ride, and since Emelie’s absolute favorite thing is swinging, she has longed to ride it. But every time, she’s not been tall enough. Until now. 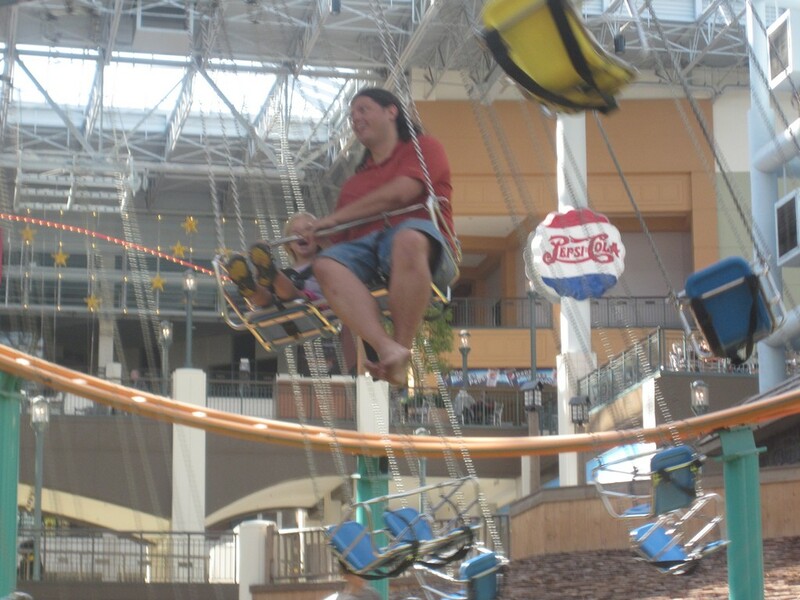 The one at MOA has some of the chairs that are double so that little ones can ride with a chaperon. She only had to be 39 inches tall. I’m not sure she would’ve been 39 inches without her shoes on – it was that close – but she was tall enough to ride. So we broke down and bought her a strip of ride points, which were also significantly discounted for Toddler Tuesday. As it turns out, they don’t charge for the adult chaperon to ride along, which we thought was really decent. But it also meant that she had twice as many ride points, since we weren’t using any to ride with her. She tried the ferris wheel, a train ride, and several other things which she really liked a lot. But in the end, she rode that swing ride 3 times, and when all her points were gone on that last swing, she cried and cried and we had to pull her off of it kicking and screaming. Oh how it wished that we hadn’t left the good camera in the car! 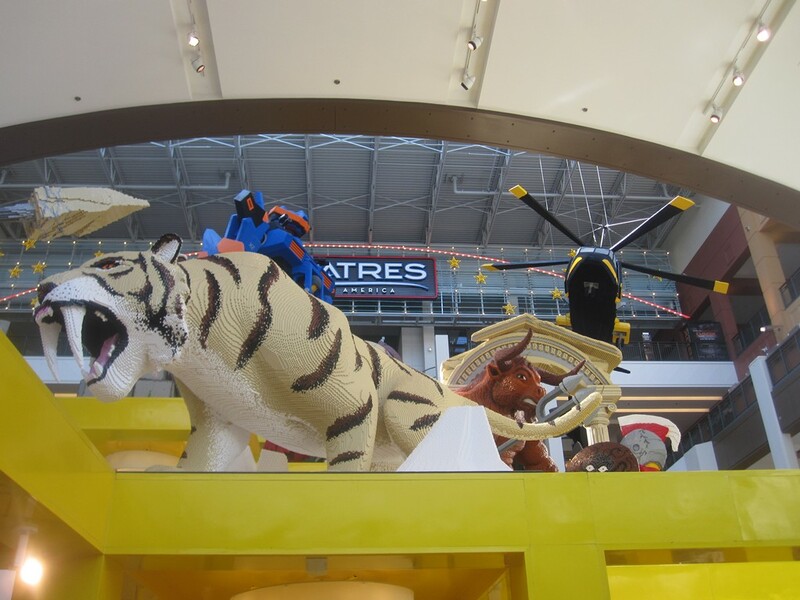 There’s also a Lego World store in the mall, right by the amusement park. They have Duplo tables in a little seating area so that kids can build and have fun. 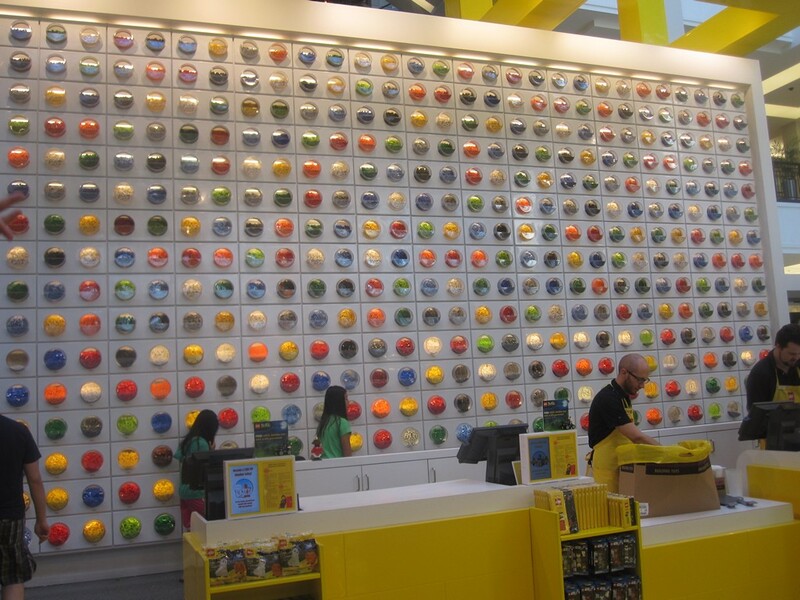 This place was amazing, whether or not you happen to be a Lego nerd (Staffan is, I am not). The wall of Lego. Sorted by color and size. I think you buy it by weight. Just think, someone’s job is to build these larger than life displays out of Lego. I can think of worse jobs. Toddler Tuesday was a pretty good deal. 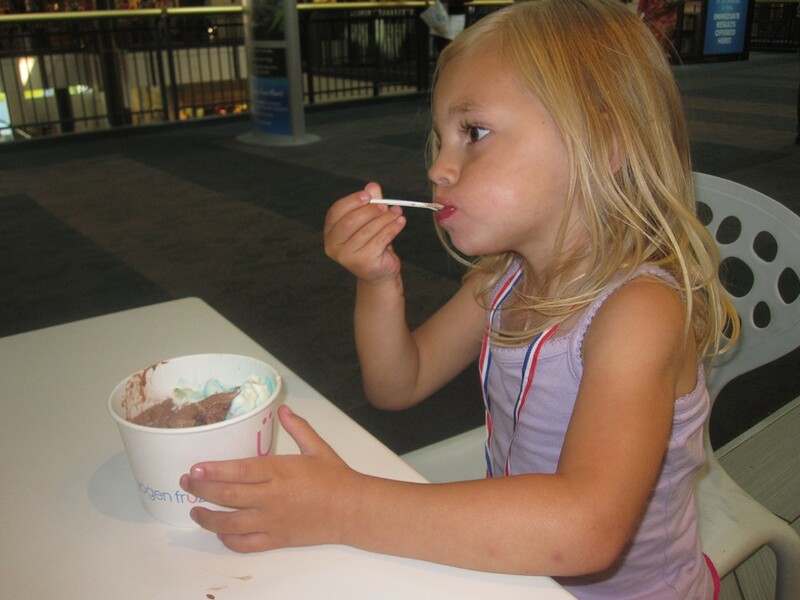 A lot of the mall restaurants had “kids eat free” specials in honor of Toddler Tuesday and we got a coupon for buy-one-get-one-free ice cream. So after a very full day, we wrapped up with some ice cream and went on our way. Tired, but never too tired for ice cream. Still sporting her medal, of course. And so it was that we spent an entire day in a mall without actually shopping. Well, with one exception. Somewhere along the line, Peter took his pacifier, strap and all, and threw it without us noticing. We tried retracing our steps, but it’s a big place and we’d been all over. He was fussy and not settling down to nap without it, so I set out to buy a new one. How hard could it be, right? I’m in America’s largest mall. I looked everywhere I could think of for over an hour before someone finally said they’d seen them at Nordstrom. And so we also found out how long you have to listen to your baby cry before you’re willing to pay Nordstrom’s prices to buy the only pacifier in all of the Mall of America. But even with the crying baby and the nearly fruitless paci-quest, we still had a really great day!